Tisha Morris is the best-selling author of CLUTTER INTERVENTION: How Your Stuff is Keeping You Stuck (Llewellyn Publishing), Decorating With the Five Elements of Feng Shui (Llewellyn 2015), Mind Body Home: Transform Your Life One Room at a Time (reprint 2018, Llewellyn 2012), and Feng Shui Your Life: The Quick Guide to Decluttering Your Home and Renewing Your Life (Turner Publishing 2010). Go beyond basic decluttering and get to the root of why you have such a hard time getting rid of your stuff. Clutter Intervention will teach you about the psychological, emotional, and energetic components underlying your possessions, making it easier for you to let go and live authentically. Everything in your home is an extension of your identity, and when you hold onto old stuff for too long, you get stuck in the past. Tisha Morris shows you how to move into a new phase of life by ridding yourself of everything holding you back. Using step-by-step instruction and easy to understand explanations, this book helps you live in alignment with who you are and manifest what you want in life. The Five Elements are the bridge between nature and our spaces and the science behind decorating. The five elements?Wood, Fire, Earth, Metal, Water?are the threads of energy that connect all living beings with nature. Learn how each element is expressed not only in nature, but also through you and your home. Start with a quiz to understand your elemental makeup. Then follow the three-step formula to incorporate feng shui into your life. 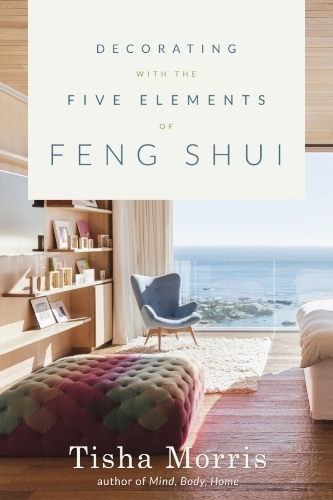 With a room-to-room guide for using the five elements, instructions for healing spaces both inside and outside, and much more, Decorating With the Five Elements of Feng Shui will help you find harmony in your body, your home, and the world. Your Home is the Key to a Successful Holistic Life. The home is an essential part of holistic living and right at our fingertips. Holistic is about bringing the whole into balance. Our living spaces are integral to this balancing equation. What does the stuff in your home say about your life? Do your closets overflow? Is the area under your bed permanent storage space for junk? In Feng Shui Your Life, Tisha Morris provides quick, easy, and practical feng shui techniques to help you get rid of clutter and rearrange your home. By following simple steps and checklists, you can create an inviting, personal atmosphere in your home, ultimately renovating your life. Do you feel overwhelmed with where to start in your home? If so, this book is for you! Instead of trying to understand theories and calculations, this book will get you rolling up your sleeves and moving your feet. And that’s when the magic happens!